Fei Hui, Mario Lanza* et al., International Patent, Ref. no. WO2016/074305, July 16th of 2016. Received 1 M$ investment from BICI. Michael J. Kenney, Mario Lanza et al., Science, 342, 836–840, 2013. Yuanyuan Shi, Mario Lanza* et al., Nature Electronics 1, 458–465, 2018. M. Lanza et al., Advanced Materials, 25, 1440–1444, 2013. Ching-Hua Wang, M. Lanza et al., 2018 IEDM Tech. Dig. DOI: 10.1109/IEDM.2018.8614495. Dec. 1st-5th 2018, San Francisco, USA. Yuanyuan Shi, M. Lanza* et al., 2017 IEDM Tech. Dig. DOI: 10.1109/IEDM.2017.8268333. Dec. 2nd-6th 2017, San Francisco, USA. F. Puglisi*, M. Lanza* et al., 2016 IEDM Tech. Dig. DOI: 10.1109/IEDM.2016.7838544. Dec. 4th-7th 2016, San Francisco, USA. M. Nafría, M. Lanza et al., 2011 IEDM Tech. Dig. DOI: 10.1109/IEDM.2011. 6131500. Dec. 5th- 7th, 2011, Washington DC, USA. Segi Byun, Mario Lanza* et al., Advanced Functional Materials, 1806662, 2019. Shaochuan Chen, Mario Lanza* et al., Advanced Functional Materials, 1802266, 2018. Na Xiao, Mario Lanza* et al., Advanced Functional Materials, 27, 1700384, 2017. Chengbin Pan, Mario Lanza* et al., Advanced Functional Materials, 27, 1604811, 2017. Xu Jing, Mario Lanza* et al., Nano Energy, 30, 494–502, 2016. Mario Lanza, “Conductive Atomic Force Microscopy”, Book published by Wiley-VCH, ISBN: 978-3-527-34091-0, August 2017. Xu Jing, Yury Illarionovv, Eilam Yalon, Peng Zhou, Tibor Grasser, Yuanyuan Shi, Mario Lanza*, “Engineering field effect transistors with two-dimensional semiconducting channels: status and prospects”, Advanced Functional Materials, in press, 2019. Miguel Muñoz-Rojo, Mario Lanza*, “Scanning Thermal Microscopy (SThM) – a review”, Advanced Functional Materials, in press, 2019. Felix Palumbo*, Chao Wen, Salvatore Lombardo, Sebastian Pazos, Fernando Aguirre, Moshe Eizenberg, Fei Hui, Mario Lanza*, “A review on dielectric breakdown in thin dielectrics: silicon dioxide, high-k and layered dielectrics”, Advanced Functional Materials, in press, 2019. Xu Jing, Francesco Maria Puglisi, Deji Akinwande and Mario Lanza*, “Chemical vapor deposition of hexagonal boron nitride on metal-coated wafers and transfer-free fabrication of resistive switching devices”, 2D Materials, DOI: 10.1088/2053-1583/ab1783. Bin Yuan, Xianhu Liang, Liubiao Zhong, Yuanyuan Shi, Felix Palumbo, Shaochuan Chen, Fei Hui, Xu Jing, Marco A. Villena, Lin Jiang, and Mario Lanza*, “150 nm × 200 nm Cross-Point Hexagonal Boron Nitride Based Memristors”, Advanced Electronic Materials, DOI: 10.1002/aelm.201900115. Chao Wen, Xu Jing, Frank F. Hitzel, Chengbin Pan, Günther Benstetter, Mario Lanza*,”In situ observation of current generation in ZnO nanowire based nanogenerators using a CAFM integrated into an SEM”, ACS Applied Materials & Interfaces, DOI: 10.1021/acsami.9b00447. Lanlan Jiang, Jonas Weber, Francesco Maria Puglisi, Polo Pavan, Luca Larcher, Werner Frammelsberger, Guenther Benstetter and Mario Lanza*, Understanding Current Instabilities in Conductive Atomic Force Microscopy”, Materials, 12(3), 459, 2019. Segi Byun, Gihun Jung, Yuanyuan Shi, Mario Lanza* , Byungha Shin*, “Aging of a Vanadium Precursor Solution: Influencing Material Properties and Photoelectrochemical Water Oxidation Performance of Solution-Processed BiVO4 Photoanodes”, Advanced Functional Materials, 1806662, 2019. Shaochuan Chen, Lanlan Jiang, Mark Buckwell, Xu Jing, Yanfeng Ji, Enric Grustan-Gutierrez, Fei Hui, Yuanyuan Shi, Mathias Rommel, Albena Paskaleva, Guenther Benstetter, Wing H. Ng, Adnan Mehonic, Anthony J. Kenyon and Mario Lanza* , “On the limits of Scalpel AFM for the 3D electrical characterization of nanomaterials”, Advanced Functional Materials, 1802266, 2018. Mario Lanza*, H.-S. Philip Wong, Eric Pop, Daniele Ielmini, Dimitri Strukov, Brian C. Regan, Luca Larcher, Marco A. Villena, J. Joshua Yang, Ludovic Goux, Attilio Belmonte, Yuchao Yang, Francesco M. Puglisi, Jinfeng Kang, Blanka Magyari-Köpe, Eilam Yalon, Anthony Kenyon, Mark Buckwell, Adnan Mehonic, Alexander Shluger, Haitong Li, Tuo-Hung Hou, Boris Hudec, Deji Akinwande, Ruijing Ge, Stefano Ambrogio, Juan B. Roldan, Enrique Miranda, Jordi Suñe, Kin Leong Pey, Xing Wu, Nagarajan Raghavan, Ernest Wu, Wei D. Lu, Gabriele Navarro, Weidong Zhang, Huaqiang Wu, Runwei Li, Alexander Holleitner, Ursula Wurstbauer, Max C. Lemme, Ming Liu, Shibing Long, Qi Liu, Hangbing Lv, Andrea Padovani, Paolo Pavan, Ilia Valov, Xu Jing, Tingting Han, Kaichen Zhu, Shaochuan Chen, Fei Hui, and Yuanyuan Shi, “Recommended methods to study resistive switching devices”, Advanced Electronic Materials, 28, 1800143, 2018. Yuanyuan Shi, Xianhu Liang, Bin Yuan, Victoria Chen, Haitong Li, Fei Hui, Zhouchangwan Yu, Fang Yuan, Eric Pop, H.-S. Philip Wong, Mario Lanza*,”Electronic synapses made of layered two-dimensional materials“, Nature Electronics 1, 458–465, 2018. Fei Hui, Marco A Villena, Wenjing Fang, Ang-Yu Lu, Jing Kong, Yuanyuan Shi, Xu Jing, Kaichen Zhu and Mario Lanza*, “Synthesis of large-area multilayer hexagonal boron nitride sheets on iron substrates and its use in resistive switching devices“, 2D Materials, 5, 031011, 2018. Marek Hempel, Ang-Yu Lu, Fei Hui, Tewa Kpulun, Mario Lanza, Gary Harris, Tomas Palacios and Jing Kong, “Repeated Roll-to-Roll Transfer of Two-Dimensional Materials by Electrochemical Delamination”, Nanoscale, 10, 5522-5531, 2018. Vladimir A. Gritsenko,* Yuriy N. Novikov, Timofey V. Perevalov, Vladimir N. Kruchinin, Vladimir S. Aliev, Alina K. Gerasimova, Simon B. Erenburg, Svetlana V. Trubina, Kristina O. Kvashnina, Igor P. Prosvirin,* and Mario Lanza, “Nanoscale Potential Fluctuations in Zirconium Oxide and the Flash Memory Based on Electron and Hole Localization”, Advanced Electronic Materials, 4, 1700592, 2018. Bingru Wang, Na Xiao, Chengbin Pan, Yuanyuan Shi, Fei Hui, Xu Jing, Kaichen Zhu, Biyu Guo, Marco A. Villena, Enrique Miranda, Mario Lanza*, “Experimental observation and mitigation of dielectric screening in hexagonal boron nitride based resistive switching devices”, Crystal Research and Technology, 53, 1800006, 2018. Felix Palumbo, Xianhu Liang, Bin Yuan, Yuanyuan Shi, Fei Hui, Marco A. Villena, Mario Lanza*, “Bimodal Dielectric Breakdown in Electronic Devices Using Chemical Vapor Deposited Hexagonal Boron Nitride as Dielectric”, Advanced Electronic Materials, 1700506, 2018. Shosuke Fujii, Jean Anne C. Incorvia, Fang Yuan, Shengjun Qin, Fei Hui, Yuanyuan Shi, Yang Chai, Mario Lanza, H.-S. Philip Wong, “Scaling the CBRAM Switching Layer Diameter to 30 nm Improves Cycling Endurance”, IEEE Electron Device Letters, 39, 23-26, 2017. Marco A Villena, Juan B Roldán, Francisco Jiménez-Molinos, Enrique Miranda, Jordi Suñé, Mario Lanza*, “SIM2RRAM: a physical model for RRAM devices simulation”, Journal of Computational Electronics, 16, 1095–1120, 2017. Fei Hui, Wenjing Fang, Wei Sun Leong, Tewa Kpulun, Haozhe Wang, Hui Ying Yang, Marco A. Villena, Gary Harris, Jing Kong, and Mario Lanza*, “Electrical Homogeneity of Large-Area Chemical Vapor Deposited Multilayer Hexagonal Boron Nitride Sheets”, ACS Applied Materials & Interfaces, 9(46), 39895-39900, 2017. Lanlan Jiang, Yuanyuan Shi, Fei Hui, Kechao Tang, Qian Wu, Chengbin Pan, Xu Jing, Hasan Uppal, Felix Roberto Mario Palumbo, Guangyuan Lu, Tianru Wu, Haomin Wang, Marco A. Villena, Xiaoming Xie, Paul C McIntyre, and Mario Lanza*, “Dielectric Breakdown in Chemical Vapor Deposited Hexagonal Boron Nitride”, ACS Applied Materials & Interfaces, 9(45), 39758–3977, 2017. Fei Hui, Shaochuan Chen, Xianhu Liang, Bin Yuan, Xu Jing, Yuanyuan Shi, Mario Lanza*, “Graphene Coated Nanoprobes: A Review”, Crystals, 7, 269, 2017. Tingting Han, Stefania Privitera*, Rachela Gabriella Milazzo, Corrado Bongiorno, Salvatore Di Franco, Francesco La Via, Xiaoxue Song, Yuanyuan Shi, Mario Lanza, Salvatore Lombardo, “Photo-electrochemical water splitting in silicon based photocathodes enhanced by plasmonic/catalytic nanostructures”, Materials Science and Engineering: B, 225,128-133, 2017. Xiaoxue Song, Fei Hui, Theresia Knobloch, Bingru Wang, Zhongchao Fan, Tibor Grasser, Xu Jing, Yuanyuan Shi, Mario Lanza*, “Piezoelectricity in two dimensions: Graphene vs. molybdenum disulfide”, Applied Physics Letters, 111, 083107, 2017. Kechao Tang, Andrew C. Meng, Fei Hui, Yuanyuan Shi, Trevor Petach, Charles Hitzman, Ai Leen Koh, David Goldhaber-Gordon, Mario Lanza, and Paul C. McIntyre*, “Distinguishing Oxygen Vacancy Electromigration and Conductive Filament Formation in TiO2 Resistance Switching Using Liquid Electrolyte Contacts”, Nano Letters, 17(7), 4390–4399, 2017. Na Xiao, Marco A. Villena, Bin Yuan, Shaochuan Chen, Bingru Wang, Marek Eliáš, Yuanyuan Shi, Fei Hui, Xu Jing, Andrew Scheuerman, Kechao Tang, Paul C. McIntyre and Mario Lanza*, “Resistive random access memory cells with a bilayer TiO2/SiOx insulating stack for simultaneous filamentary and distributed resistive switching”, Advanced Functional Materials, 27, 1700384, 2017.59. Chengbin Pan, Enrique Miranda, Marco A Villena, Na Xiao, Xu Jing, Xiaoming Xie, Tianru Wu, Fei Hui, Yuanyuan Shi, and Mario Lanza*, “Model for multi-filamentary conduction in graphene/hexagonalboron-nitride/graphene based resistive switching devices”, 2D Materials, 4, 2, 2017. Mario Lanza*, Umberto Celano, Feng Miao, “Nanoscale characterization of resistive switching using advanced conductive atomic force microscopy based setups”, Journal of Electroceramics, 39, 94–108, 2017. Xiaoxue Song, Fei Hui, Keith Gilmore, Bingru Wang, Guangyin Jing, Zhongchao Fan, Enric Grustan-Gutierrez, Yuanyuan Shi, Lucia Lombardi, Stephen A. Hodge, Andrea C. Ferrari and Mario Lanza*, “Enhanced piezoelectric effect at the edges of stepped molybdenum dissulfide nanosheets”, Nanoscale, 9, 6237–6245, 2017. Chengbin Pan, Yanfeng Ji, Na Xiao, Fei Hui, Kechao Tang, Yuzheng Guo, Xiaoming Xie, Francesco M. Puglisi, Luca Larcher, Enrique Miranda, Lanlan Jiang, Yuanyuan Shi, Ilia Valov, Paul C. McIntyre, Rainer Waser and Mario Lanza*, “Coexistence of Grain-Boundaries-Assisted Bipolar and Threshold Resistive Switching in Multilayer Hexagonal Boron Nitride”, Advanced Functional Materials, 27, 1604811, 2017. Selected as frontispiece. Xu Jing, Emanuel Panholzer, Xiaoxue Song, Enric Grustan-Gutierrez, Fei Hui, Yuanyuan Shi, Guenther Benstetter, Yury Illarionov, Tibor Grasser and Mario Lanza*, “Fabrication of scalable and ultra low power photodetectors with high light/dark current ratios using polycrystalline monolayer MoS2 sheets”, Nano Energy, 30, 494–502, 2016. Yuanyuan Shi, Tingting Han, Carolina Gimbert-Suriñach, Xiaoxue Song, Mario Lanza*, Antoni Llobet*, “Substitution of native silicon oxide by titanium in Ni-coated silicon photoanodes for water splitting solar cells”, Journal of Materials Chemistry A, 5, 1996–2003, 2017. Selected as front cover article. Lanlan Jiang, Na Xiao, Bingru Wang, Enric Grustan-Gutierrez, Xu Jing, Petr Babor, Miroslav Kolíbal, Guangyuan Lu, Tianru Wu, Haomin Wang, Fei Hui, Yuanyuan Shi, Bo Song, Xiaoming Xie, Mario Lanza*, “High resolution characterization of Hexagonal Boron Nitride Coatings exposed to aqueous and air oxidative environments”, Nano Research, 10(6): 2046–2055, 2017. Fei Hui, Pujashree Vajha, Yanfeng Ji, Chengbin Pan, Enric Grustan-Gutierrez, Huiling Duan, Peng He, Guqiao Ding, Yuanyuan Shi, Mario Lanza*, “Variability of graphene devices fabricated using graphene inks: atomic force microscope tips”, Surface & Coatings Technology, 320, 391–395, 2017. Enric Grustan-Gutierrez, Chuqi Wei, Bingru Wang, and Mario Lanza*, “Sputtering and amorphization of crystalline semiconductors by Nanodroplet Bombardment”, Crystal Research and Technology, 1600240, 2017. Fei Hui, Chengbin Pan, Yanfeng Ji, Yuanyuan Shi, Mario Lanza*, “On the use of two dimensional hexagonal boron nitride as dielectric”, Microelectronic Engineering, 163, 119–133, 2016 – Invited Review. Tingting Han,‡ Yuanyuan Shi,‡ Xiaoxue Song, Antonio Mio, Luca Valenti, Fei Hui, Stefania Privitera, Salvatore Lombardo and Mario Lanza*, “Ageing mechanisms of highly active and stable nickel-coated silicon photoanodes for water splitting”, Journal of Materials Chemistry A, 4, 8053–8060, 2016. ‡Equal contribution. Selected as back cover article. Chengbin Pan, Jianchen Hu, Enric Grustan-Gutierrez, Minh Tuan Hoang, Huiling Duan, Julien Yvonnet, Alexander Mitrushchenkov, Gilberte Chambaud, Mario Lanza*, “Suppression of nanowires clustering in hybrid energy harvesters”, Journal of Materials Chemistry C, 4, 3646–3653, 2016. Yuanyuan Shi, Carolina Gimbert-Suriñach, Tingting Han, Serena Berardi, Mario Lanza*, Antoni Llobet*, “CuO functionalized silicon photoanodes for efficient photoelectro-chemical water splitting devices”, ACS Applied Materials Interfaces, 8, 696–702, 2016. Fei Hui, Pujashree Vajha, Yuanyuan Shi, Yanfeng Ji, Huiling Duan, Andrea Padovani, Luca Larcher, Xiao-Rong Li, Jing-Juan Xu, Mario Lanza*, “Moving graphene devices from lab to market: advanced graphene-coated nanoprobes”, Nanoscale, 8, 8466–8473, 2016. Selected as front cover article. Yanfeng Ji, Chengbin Pan, Meiyun Zhang, Shibing Long, Xiaojuan Lian, Feng Miao, Fei Hui, Yuanyuan Shi, Luca Larcher, Ernest Wu, Mario Lanza*, “Boron nitride as two dimensional dielectric: reliability and dielectric breakdown”, Applied Physics Letters, 108, 012905, 2016. Yanfeng Ji, Jianchen Hu, Mario Lanza*, “A future way of storing information: the resistive random access memory”, IEEE Nanotechnology Magazine, 9, 12–17, 2015 – Invited Communication. Yuanyuan Shi, Yanfeng Ji, Fei Hui, Montserrat Nafria, Marc Porti, Gennadi Bersuker, Mario Lanza*, “In situ demonstration of the link between mechanical strength and resistive switching in resistive random-access memories”, Advanced Electronic Materials, 1, 1400058, 2015. Yanfeng Ji, Fei Hui, Yuanyuan Shi, Vanessa Iglesias, David Lewis, Jiebin Niu, Shibing Long, Ming Liu, Alexander Hofer, Werner Frammelsberger, Guenther Benstetter, Andrew Scheuermann, Paul C. McIntyre, Mario Lanza1, “Characterization of the photocurrents generated by the laser of atomic force microscopes”, Review of Scientific Instruments, 87, 083703 (2016). Yanfeng Ji, Fei Hui, Yuanyuan Shi, Tingting Han, Xiaoxue Song, Chengbin Pan and Mario Lanza*, “Fabrication of a fast-response and user-friendly environmental chamber for atomic force microscopes”, Review of Scientific Instruments, 86, 106105, 2015. Yuanyuan Shi, Yanfeng Ji, Hui Sun, Fei Hui, Jianchen Hu, Yaxi Wu, Jianlong Fang Hao Lin, Jianxiang Wang, Huiling Duan*, Mario Lanza*, “Nanoscale characterization of PM2.5 airborne pollutants reveals high adhesiveness and aggregation capability of soot particles”, Nature Scientific Reports, 5, 11232, 2015. Fei Hui, Yuanyuan Shi, Yanfeng Ji, Mario Lanza*, Huiling Duan*, “Mechanical properties of locally oxidized graphene electrodes”, Archive of Applied Mechanics, 85, 339–345, 2015. Jianchen Hu, Heng Li, Huiling Duan, Mario Lanza*, “Improvement of the electrical contact resistance at rough interfaces using two dimensional materials”, second revision, Journal of Applied Physics, 118, 215301, 2015. Yuanyuan Shi, Fei Hui, Yanfeng Ji, Hai-Hua Wu, Mario Lanza*, “Ageing mechanisms and reliability of graphene-based electrodes”, Nano Research, 7, 1820–1831, 2014. Mario Lanza, Marc Reguant, Guijin Zou, Pengyu Lv, Heng Li, Richard Chin, Haiyi Liang, Dapeng Yu, Huiling Duan*, “High performance piezoelectric nanogenerators using two dimensional flexible top electrodes”, Advanced Materials Interfaces, 1 , 1300101, 2014. Mario Lanza*, “A Review on Resistive Switching in High-k Dielectrics: A Nanoscale point of View Using Conductive Atomic Force Microscope”, Materials, 7, 2155–2182, 2014 – Invited Review. Y. Shi, Y. Ji, F. Hui, V. Iglesias, M. Porti, M. Nafria, E. Miranda, G. Bersuker, M Lanza*, “Elucidating the Origin of Resistive Switching in Ultrathin Hafnium Oxides through High Spatial Resolution Tools”, ECS Transactions, 64, 19–28 (2014) – Invited paper. K. Zhang, M. Lanza, Z Shen*, Q Fu, S Hou, M Porti, M Nafría, “Analysis of Factors in the Nanoscale Physical and Electrical Characterization of High-K Materials by Conductive Atomic Force Microscope”, Integrated Ferroelectrics, 153, 1–8, 2014. A. Bayerl, Q. Wu, M. Porti, J. Martin-Martínez, M. Lanza, R. Rodriguez, V. Velayudhan, M. Nafria, X. Aymerich, M.B Gonzalez, E. Simoen, “A Conductive AFM nanoscale analysis of NBTI and Channel hot-carriers degradation in MOSFETs”, IEEE Transactions on Electron Devices, 61, 3118–3124, 2014. M. Lanza, Y. Wang, Hui Sun, Yuzhen Tong, H. L. Duan*, “Morphology and performance of graphene layers on as-grown and transferred substrates”, Acta Mechanica, 225, 1061–1073, 2014. Jianchen Hu, Yanfeng Ji, Yuanyuan Shi, Fei Hui, Huiling Duan and Mario Lanza*, “A review on the use of graphene as a protective coating,”Annals of Materials Science and Engineering, 1, 1–16, 2014 – Invited Review. Michael J. Kenney, Ming Gong, Yanguang Li, Justin Z. Wu, Ju Feng, Mario Lanza and Hongjie Dai*, “High-Performance Silicon Photoanodes Passivated with Ultrathin Nickel Films for Water Oxidation”, Science, 342, 836–840, 2013 – Highlighted by Science in section Perspectives. Research paper published in Science in the field of MOS-based water splitting devices. Mario Lanza, Teng Gao, Zixuan Yin, Yanfeng Zhang, Zhongfan Liu, Yuzhen Tong, Ziyong Shen, Huiling Duan*, “Nanogap based graphene coated AFM tips with high spatial resolution, conductivity and durability”, Nanoscale, 5, 10816–10823, 2013. O. Pirrotta, L. Larcher*, M. Lanza, A. Padovani, M. Porti, M. Nafria, G. Bersuker, “Leakage current though the poly-crystalline HfO2: Trap densities at the grains and grain boundaries”, Journal of Applied Physics, 114, 134503, 2013. Mario Lanza, Yan Wang, Teng Gao, Albin Bayerl, Marc Porti, Montserrat Nafria, Yangbo Zhou, Guangying Jin, Zhongfan Liu, Yanfeng Zhang, Dapeng Yu, Huiling Duan*, “Electrical and mechanical performance of graphene sheets exposed to oxidative environments”, Nano Research, 6, 485–495, 2013 – Selected as cover article. A. Bayerl*, M. Lanza, L. Aguilera, M. Porti, M. Nafría, X. Aymerich, S. De Gendt, “Nanoscale and device level electrical behavior of ALD annealed Hf-based gate stacks grown with different precursors”, Microelectronics Reliability, 53, 6, 867–871, 2013. M. Lanza, Y. Wang, A. Bayerl, T. Gao, M. Porti, M. Nafria, H. Liang, G. Jing, Z. Liu, Y. Zhang, Y. Tong, H. Duan*, “Tuning graphene morphology by substrate towards wrinkle-free devices: experiment and simulation”, Journal of Applied Physics, 113, 104301, 2013 . M. Lanza, A. Bayerl, T. Gao, M. Porti, M. Nafria, G. Jing, Y. Zhang, Z. Liu, H. Duan*, “Graphene-coated Atomic Force Microscope tips for reliable nanoscale electrical characterization”, Advanced Materials, 25, 1440–1444, 2013. M. Lanza*, G. Bersuker, M. Porti, E. Miranda, M. Nafría, X. Aymerich, “Resistive switching in hafnium dioxide layers: Local phenomenon at grain boundaries”, Applied Physics Letters, 101, 193502, 2012. M. Lanza*, K. Zhang, M. Porti, M. Nafria, Z. Y. Shen*, L. F. Liu*, J. F. Kang, D. Gilmer, and G. Bersuker, “Grain boundaries as preferential sites for resistive switching in the HfO2 resistive random access memory structures”, Applied Physics Letters, 100, 123508, 2012. A. Fontserè, A. Pérez-Tomás*, M. Placidi, J. Llobet, N. Baron, S. Chenot, Y. Cordier, J. C. Moreno, V. Iglesias, M. Porti, A. Bayerl, M. Lanza, and M. Nafría, “Gate current analysis of AlGaN/GaN on silicon heterojunction transistors at the nanoscale”, Applied Physics Letters, 101, 093505, 2012. A. Fontserè*, A. Pérez-Tomás, M. Placidi, J. Llobet, N. Baron, S. Chenot, Y. Cordier, J. C. Moreno, M. R. Jennings, P. M. Gammon, C. A. Fisher, V. Iglesias, M. Porti, A. Bayerl, M. Lanza, and M. Nafría, “Nanoscale investigation of AlGaN/GaN-on-Si high electron mobility transistors”, Nanotechnology, 23, 395204, 2012. V. Iglesias*, M. Lanza, M. Porti, M. Nafría, X. Aymerich, L. F. Liu, J. F. Kang, G. Bersuker, K. Zhang, Z. Y. Shen, “Nanoscale observations of Resistive Switching High and Low conductivity states on TiN/HfO2/Pt structures”, Microelectronics Reliability, 52, 2110–2114, 2012. A. Fontsere*, A. Perez-Tomas, M. Placidi, J. Llobet, N. Baron, S. Chenot, Y. Cordier, J. C. Moreno, P. M. Gammon, M. R. Jennings, M. Porti, A. Bayerl, M. Lanza and M. Nafria, “Micro and nano analysis of 0.2 Ω mm Ti/Al/Ni/Au ohmic contact to AlGaN/GaN”, Applied Physics Letters, 99, 213504, 2011. V. Iglesias, M. Lanza*, K. Zhang, A. Bayerl, M. Porti, M. Nafría, X. Aymerich, G. Benstetter, Z. Y. Shen*, and G. Bersuker, “Degradation of polycrystalline HfO2-based gate dielectrics under nanoscale electrical stress”, Applied Physics Letters, 99, 103510, 2011. A. Bayerl, M. Lanza, M. Porti, M. Nafría, X. Aymerich, G. Benstetter, “Nanoscale and Device Level Gate Conduction Variability of High-k Dielectrics-Based Metal-Oxide-Semiconductor Structures”, IEEE Transactions On Device And Materials Reliability, 11, 495–501, 2011. A. Bayerl*, M. Lanza, M. Porti, F. Campabadal, M. Nafría, X. Aymerich, “Reliability and gate conduction variability of HfO2-based MOS devices: a combined nanoscale and device level study”, Microelectronic Engineering, 88, 1334–1337, 2011. K. McKenna*, A. Shluger, V. Iglesias, M. Porti, M. Nafría, M. Lanza, G. Bersuker, “Grain boundary mediated leakage current in polycrystalline HfO2 films”, Microelectronics Engineering, 88, 1272–1275, 2011. M. Lanza*, V. Iglesias, M. Porti, M. Nafría and X. Aymerich, “Polycrystallization effects on the variability of the electrical properties of high-k dielectrics at the nanoscale”, Nanoscale Research Letters, 6, 108, 2011. M. Lanza, M. Porti, M. Nafría, X. Aymerich, G. Benstetter, E. Lodermeier, H. Ranzinger G. Jaschke, S. Teichert, L. Wilde and P. Michalowski, “Conductivity and charge trapping after electrical stress in amorphous and polycristalline Al2O3 based devices studied with AFM related techniques”, IEEE Transactions on Nanotechnology, 10, 344–351, 2011. M. Nafría, R. Rodríguez, M. Porti, J. Martín-Martínez, M. Lanza and X. Aymerich, “Variability and Reliability in Ultra-Scaled MOS Devices: How Should They Be Evaluated from Nanoscale to Circuit Level?”, ECS Transactions, 28, 225–236, 2010. M. Lanza*, M. Porti, M. Nafría, X. Aymerich, E. Wittaker and B. Hamilton, “Electrical resolution during Conductive AFM measurements under different environmental conditions and contact forces”, Review of Scientific Instruments, 81, 106110, 2010. M. Lanza*, M. Porti, M. Nafría, X. Aymerich, E. Whittaker and B. Hamilton, “UHV CAFM characterization of high-k dielectrics: effect of the technique resolution on the pre- and post-breakdown electrical measurements”, Microelectronics Reliability, 50, 1312–1315, 2010. M. Lanza, M. Porti, M. Nafría, X. Aymerich, A. Sebastiani, G. Ghidini, A. Vedda, and M. Fasoli, “Combined Nanoscale and Device-Level Degradation Analysis of SiO2 Layers of MOS Nonvolatile Memory Devices”, IEEE Transactions on device and materials reliability, 9, 529–536, 2009. M. Lanza*, M. Porti, M. Nafría, X. Aymerich, G. Ghidini and A. Sebastiani, “Trapped charge and Stress Induced Leakage Current (SILC) in tunnel SiO2 layers of de-processed MOS non-volatile memory devices observed at the nanoscale”, Microelectronics Reliability, 49, 1188–1191, 2009. M. Lanza*, M. Porti, M. Nafría, X. Aymerich, G. Benstetter, E. Lodermeier, H. Ranzinger, G. Jaschke, S. Teichert, L.Wilde and P. Michalowski, “Crystallization and silicon diffusion nanoscale effects on the electrical properties Of Al2O3 based devices”, Microelectronic Engineering, 86, 1921–1924, 2009. L. Aguilera*, M. Lanza, A. Bayerl, M. Porti, M. Nafría, and X. Aymerich, “Development of a Conductive Atomic Force Microscope with a logarithmic current-to-voltage converter for the study of MOS gate dielectrics reliability”, Journal of Vacuum Science and Technology B, 27, 360–363, 2009. L. Aguilera*, M. Lanza, M. Porti, J. Grifoll, M. Nafría, and X. Aymerich, “Improving the electrical performance of a conductive atomic force microscope with a logarithmic current-to-voltage converter”, Review of Scientific instruments, 79, 073701, 2008. M. Lanza*, M. Porti, M. Nafría, G. Benstetter, W. Frammelsberger, H. Ranzinger, E. Lodermeier and G. Jaschke, “Influence of the manufacturing process on the Electrical properties of thin (<4nm) Hafnium based high-k stacks observed with CAFM”, Microelectronics Reliability, 47, 1424–1428, 2007. Fei Hui, Yuanyuan Shi, Mario Lanza*, “Cost-effective fabrication of ultra-durable atomic force microscope tips using graphene powder coatings”, International Patent, Ref. no. WO2016/074305, July 16th of 2016. In September 2016 this patent received 1 M$ investment from the Beijing Institute of Collaborative Innovation for creating an start-up and introducing this product in the market. Yanfeng Ji, Chengbin Pan, Fei Hui, Yuanyuan Shi, Na Xiao, Mario Lanza*, “Fabrication of a RRAM device using multilayer hexagonal boron nitride as dielectric”, International Patent PCT/CN2016/071783. M. Lanza, A. Bayerl, M. Porti, M. Nafria, H. Duan, “Graphene flexible electrodes for high efficiency piezoelectric nanogenerators”, International Patent, Ref. no. WO2015/004231 (A1), January 15th of 2015. M. Lanza, A. Bayerl, M. Porti, M. Nafria, H. Duan, “Conductive Atomic Force Microscope tips coated with Graphene”, International patent, Ref. no. WO2014/090938 (A1), June 19th of 2014. Mario Lanza, “Conductive Atomic Force Microscopy: Applications in Nanomaterials”, Publisher: Wiley-VCH, ISBN: 978-3-527-34091-0, August 2017. Includes 14 chapters, written by experts like Kin Leong Pey (SUTD), Oliver Krause (Nano World GmbH), G. Bensetter (DIT), and David Lewis (Nanonics), and Enzo di Fabrizio (KAUST), among others. This book represents the state-of-the-art in CAFM science. Guenther Benstetter, Alexander Hofer, Donping Liu, Werner Frammelsberger, Mario Lanza, “Fundamentals of CAFM Operation Modes”, Invited. Book chapter: Conductive Atomic Force Microscopy: Applications in Nanomaterials, Publisher: Wiley-VCH, ISBN: 978-3-527-34091-0, (2017). Vanessa Iglesias, Xu Jing, and Mario Lanza, “Combination of Semiconductor Parameter Analyzer and Conductive Atomic Force Microscope for Advanced Nanoelectronic Characterization”, Invited. Book chapter: Conductive Atomic Force Microscopy: Applications in Nanomaterials, Publisher: Wiley-VCH, ISBN: 978-3-527-34091-0 (2017). Chengbin Pan, Yuanyuan Shi, Fei Hui, Enric Grustan-Gutierrez and Mario Lanza, “Introduction, history and status of the CAFM”, Invited. Book chapter: Conductive Atomic Force Microscopy: Applications in Nanomaterials, Publisher: Wiley-VCH, ISBN: 978-3-527-34091-0 (2017). M. Nafría, R. Rodríguez, M. Porti, J. Martín-Martínez, M. Lanza and X. Aymerich, “Variability and Reliability in ultra-scaled MOS devices: How should they be evaluated from nanoscale to Circuit Level?” Invited. Book chapter: Dielectrics for Nanosystems IV: Materials Science, Processing, Reliability, and Manufacturing. ECS/Transactions, 28(2), pp. 225-236. ISBN: 978-1-56677-792-6. Editorial: The electrochemical society, Pennington, USA (2010). M. Nafría, R. Rodríguez, M. Porti, J. Martín-Martínez, M. Lanza and X. Aymerich,, “Variability and Reliability in Ultra-scaled MOS devices: Evaluation at the Nanoscale and impact on Device and Circuit functionality”, Invited. Book chapter: CMOS Technology pp. 81-104, ISBN: 978-1-61761-325-8. Editorial: Novascience, New York, USA (2011). M. Lanza, A. Bayerl, M. Reguant, P. Lv, C. Rubio, M. Porti, M. Nafria, H.L. Duan, “Reliable nanoscale electrical characterization using Graphene-coated Atomic Force Microscope tips”, Nanotechnology 2013: Electronics, Devices, Fabrication, MEMS, Fluidics and Computation (Volume 2), Chapter 6: NanoFab: Manufacturing & Instrumentation, pp. 466-469, ISBN: 978-1-4822-0584-8. Editorial: Nanoscience and Technology Institute, Washington, USA (2013). Albin Bayerl, M. Lanza, “Hafnium-based thin oxides: versatile insulators for microelectronics”, Invited. Book chapter: Transition Metals: Characteristics, Properties and Uses, ISBN: 978-1-61761-325-8. Editorial: Novascience Publishers, Inc. New York, USA (accepted 2014). Mario Lanza*, “Conductive atomic force microscopy: status and prospects”, 30th European Symposium on Reliability of Electron Devices, Failure Physics and Analysis (ESREF), September 23rd-26th 2019, Toulouse, France. This was a two-hours talk in which I presented updated information about the use of CAFM in nanoelectronics. Mario Lanza*, “Studying the reliability of electronic devices via conductive atomic force microscopy”, IEEE International Reliability Physics Sympossium (IEEE-IRPS), March 11th-15th 2018, Burlingame, USA. This was a two-hours talk in which I presented updated information about the use of CAFM in nanoelectronics. Mario Lanza*, “Reliability of electronic devices: nanoscale studies based on the conductive atomic force microscope”, 24th IEEE International Symposium on the Physical and Failure Analysis of Integrated Circuits (IEEE-IPFA), July 4th-7th 2017, Chengdu, China. This was a two-hours talk in which I presented updated information about the use of CAFM in nanoelectronics.ditorial: Novascience Publishers, Inc. New York, USA (accepted 2014). Xianhu Liang, Bin Yuan, Yuanyuan Shi, Fei Hui, Xu Jing, Felix Palumbo, Mario Lanza*, “Enhanced reliability of hexagonal boron nitride dielectric stacks due to high thermal conductivity”, 2018 IEEE International Reliability Physics Symposium (IRPS), 11th-15th March 2018, Burlingame, CA, USA. DOI: 10.1109/IRPS.2018.8353666. Y. Shi, C. Pan, V. Chen, N. Raghavan, K. L. Pey, F. Puglisi, E. Pop, H.-S. P. Wong, M. Lanza*, “Coexistence of volatile and non-volatile resistive switching in 2D h-BN based electronic synapses”, IEEE International Electron Devices Meeting. 2017, Dec. 2nd-6th, San Francisco. DOI: 10.1109/IEDM.2017.8268333. E. Miranda, J. Suñe, C. Pan, M. Villena, N. Xiao, and M. Lanza*, “Equivalent Circuit Model for the Electron Transport in 2D Resistive Switching Material Systems”, 47th European Solid-State Device Research Conference, September 11th-14th, Leuven (Belgium), DOI: 10.1109/ESSDERC.2017.8066598. F. Puglisi*, L. Larcher, C. Pan, N. Xiao, Y. Shi, F. Hui, M. Lanza*, “2D h-BN based RRAM devices”, IEEE International Electron Devices Meeting. 2016, Dec. 4th-7th 2016, San Francisco. DOI: 10.1109/IEDM.2016.7838544. 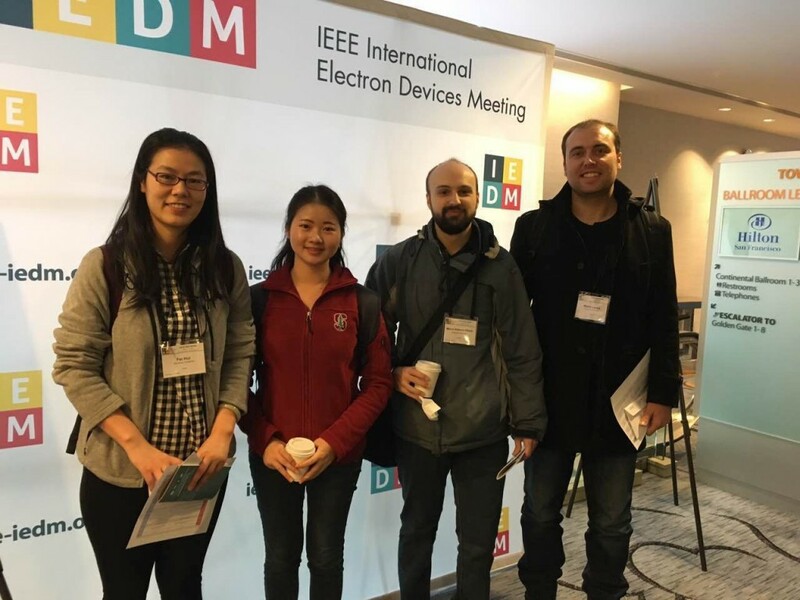 Our group presented a disruptive report on “Hexagonal Boron Nitride based Resistive Switching Mamories” at IEDM 2017. From left to right: Fei Hui, Yuanyuan Shi, Macro A. Villena and Mario Lanza. Y. Ji, C. Pan, F. Hui, Y. Shi, L. Jiang, N. Xiao, L.uca Larcher, M. Lanza*, ” Nanoscale homogeneity and degradation process of two dimensional atomically thin hexagonal boron nitride dielectric stacks”, 23rd IEEE International Symposium on the Physical and Failure Analysis of Integrated Circuits (IPFA), July 18th-21th 2016, Singapore. DOI: 10.1109/IPFA.2016.7564323. Y. Shi, Y. Ji, F. Hui, M. Nafria, M. Porti, G. Bersuker and M. Lanza*, 22nd IEEE International Symposium on the Physical and Failure Analysis of Integrated Circuits (IPFA), “New insights on the origin of resistive switching in HfO2 thin films: the role of local mechanical strength”, June 29th- July 2nd 2015, Taiwan. DOI:10.1109/IPFA.2015.7224435, 472-475 pp. Q.Wu, M. Porti, A. Bayerl, M. Lanza*, J. Martin-Martínez, R. Rodriguez, M. Nafria, X. Aymerich, E. Simoen, “Impact of NBTI and CHC stress on the nanoscale electrical properties of strained and non-strained MOSFETs”, 10th IEEE Spanish Conference on Electron Devices, February 11th-13th 2015, Madrid, Spain. DOI: 10.1109/CDE.2015.7087505, 1-4 pp. F. Hui, M. Porti, M. Nafria, H. Duan, M. Lanza*, “Fabrication of graphene MEMS by standard transfer: high performance atomic force microscope tips”, 10th IEEE Spanish Conference on Electron Devices, Feb. 11th-13th 2015, Madrid, Spain. DOI: 10.1109/CDE.2015.7087444, 1-4 pp. Y. Shi, Y. Ji, F. Hui, M. Lanza*, “On the ageing mechanisms of graphene electrodes”, 10th IEEE Spanish Conference on Electron Devices, Feb. 11th-13th 2015, Madrid, Spain. DOI: 10.1109/ CDE.2015.7087446, 1-4 pp. X. Lian, M. Lanza, E. Miranda, J. Suñe, “On the properties of the conducting filament in ReRAM”, IEEE 12th International Conference on Solid-State and Integrated Circuit Technology, Invited talk, Oct 29th-31th, 2014, Guilin, China. DOI: 10.1109/ ICSICT.2014. 7021484, 1-4 pp. A. Bayerl, M. Porti, J. Martin-Martínez, M. Lanza, R. Rodriguez, V. Velayudhan, E. Amat, M. Nafria, X. Aymerich, Channel hot-carriers degradation in MOSFETs: A Conductive AFM study at the nanoscale, International Reliability Physics Symposium, April 14th-18th 2013, Monterrey, USA. DOI: 10.1109 /IRPS.2013.6532039, 5D.4.1–5D.4.6 pp. M. Lanza, Y. Wang, T. Gao, M. Porti, M. Nafria, H. Liang, G. Jing, Z. Liu, Y. Zhang, H. Duan, Nanoscale morphology of graphene on different substrates, Proceedings of the Spanish Conference on Electron Devices 2013, Feb 12th-14th, Valladolid, Spain. DOI:10.1109/ CDE.2013.6481394, 269-272 pp. A. Crespo-Yepes, M. Lanza, J. Martin-Martinez, V. Iglesias, R. Rodriguez, M. Porti, M. Nafria, and X. Aymerich, Nanoscale and device level analysis of the resistive switching phenomenon in ultra-thin high-k gate dielectrics, Proceedings of the Spanish Conference on Electron Devices 2013, Feb 12th-14th, Valladolid, Spain. DOI: 10.1109/CDE.2013.6481397, 281-284 pp. M. Nafría, R. Rodríguez, M. Porti, J. Martín-Martínez, M. Lanza and X. Aymerich, “Time-dependent variability of high-k based MOS devices: nanoscale characterization and inclusion in circuit simulators”, Invited Talk, IEEE International Electron Devices Meeting (IEDM), December 5 – 7, 2011, Washington DC, USA. DOI: 10.1109/IEDM.2011. 6131500, 6.3.1-6.3.4 pp. A. Bayerl, V. Iglesias, M. Lanza, M. Porti, M. Nafría and X. Aymerich, “High-k dielectric polycrystallization effects on the nanoscale electrical properties of MOS structures”, 8th Spanish Conference on Electron Devices, February 8-11th of 2011, Palma de Mallorca, Spain. DOI: 10.1109/SCED.2011.5744226, 1-4 pp. M. Lanza, L. Aguilera, M. Porti, M. Nafría and X. Aymerich, “Improving the electrical performance of a CAFM for gate oxide reliability measurements”, 7th Spanish Conference on Electron Devices, February 11th – 13th, 2009, Santiago, Spain. DOI: 10.1109/ SCED.2009. 4800474, 234 – 237 pp. Fei Hui, Soochow University (China), Ph.D Thesis, June 2018. Yuanyuan Shi, Universitat Rovira i Virgili (Spain), Ph.D. Thesis, June 2018. Na Xiao, Soochow University (China), M.S. Thesis, June 2018. Lanlan Jiang, Soochow University (China), M.S. Thesis, June 2018. Bingru Wang, Soochow University (China), M.S. Thesis, June 2018. Chengbin Pan, Soochow University (China), M.S. Thesis, June 2017. Xiaoxue Song, Soochow University (China), M.S. Thesis, June 2017. Tingting Han, Soochow University (China), M.S. Thesis, June 2017. Yanfeng Ji, Soochow University (China), M.S. Thesis, June 2016. Yuanyuan Shi, Soochow University (China), M.S. Thesis, June 2016. Yuanyuan Shi, Universitat Rovira i Virgili (Spain), M.S. Thesis, June 2015. Emanuel Panholzer, Deggendorf Institute of Technology (Germany), M.S. Thesis, June 2016. Marc Reguant, Universitat Autonoma de Barcelona (Spain), B.S. Thesis, July 2013. Xavier Martinez, Universitat Autonoma de Barcelona (Spain), B.S. Thesis, July 2008. Marcel Munte, Universitat Autonoma de Barcelona (Spain), B.S. Thesis, July 2007. Mario Lanza, M.S. Thesis, July 2007. “Evaluation of the electrical performance of high-k dielectrics”, July 2007. Tingting Han, Soochow University (China), PhD Thesis, expected by June 2019. Xu Jing, Soochow University (China), Ph.D. Thesis, expected by June 2020. Shaochuan Chen, Soochow University (China), PhD Thesis, expected by June 2021. Bin Yuan, Soochow University (China), M.S. Thesis, expected by June 2019.